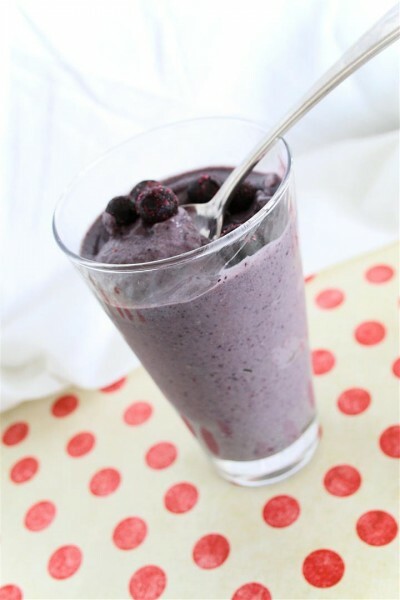 Blueberry Cream Smoothie was posted on February 3rd, 2011 and is filed under Dairy Free, Drinks & Smoothies, Kid Friendly, Low Carb, Recipes, Vegan. This entry has 5 comments. You can follow any responses through the RSS 2.0 Comment Feed. Tell me what is more refreshing after a good workout than a smoothie? In my opinion, nothing. Actually, I think a smoothie any time of day is refreshing. 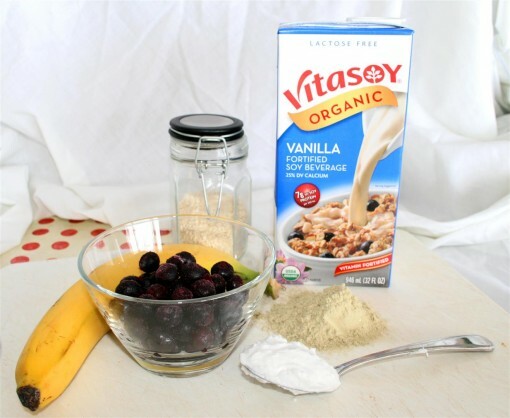 I love blended drinks…they’re so fast to whip up; you can make them as nutritious as you want, they digest easily, and they always taste delicious. Well, almost always. One of my last experiments turned out a little sour. Apparently in my rush to whirl things up in a grapefruit smoothie, I didn’t peel all the pith away from the fruit. The results were slightly bitter. But like a solider I downed most of it dutifully. I admit it was mostly because I didn’t want to waste all the expensive supplements I had added. Yes, I’m cheap. But this smoothie is as sweet as sweet can be. I’m in love with it. It’s super creamy, which makes it feel more indulgent that it really is. You could easily serve this up as a dessert, with sliced bananas and a drizzle of chocolate syrup. Besides it’s purple! What could be more fun?! Blueberries are the star of this smoothie and rightly so. They are a powerhouse of antioxidants, vitamins, and nutrients. This fruit actually protects against colon cancer, guards eyesight, cleans your insides, and the antioxidants keep your skin nice. Bring it on! I also put sesame seeds in this drink because I’m trying to up my calcium intake. Blend. Blend. And blend. All done. I often like to top up my smoothies with hemp seeds, raw sunflower seeds, or a smattering of granola just for some crunch. Enjoy! I love such smooties for a breakfast. That`s easy to make and really delicious! I love smoothies! 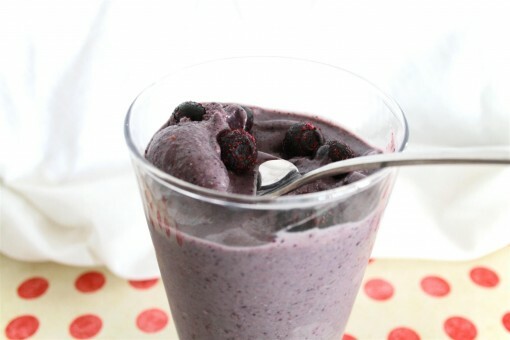 Your blueberry smoothie looks super delicious and healthy as well. p.s When I clicked your profile (left on my blog), it said Profile Not Available. SO delicious! Fruit smoothies are one of my very favorite things. My husband and I used to make them several times a week, the summer after we were married. Totally nostalgic and cheesy. :) Love your blog! I adore fruit smoothies. I have them after long runs, and they are so satisfying. The coconut cream is what is enticing for me. Nomnomnom.